I’ve only recently started going back to Stephen King’s early days and reading his classic novels. I have yet to be disappointed, and I love being able to post these reviews on Good Choice Reading, because there is something so timeless about King’s works. There is something about his themes and his characters that grip you, no matter what year you’re taking a read. And in this case, 25 years later, this book is just as good as any other you'd find in the store. 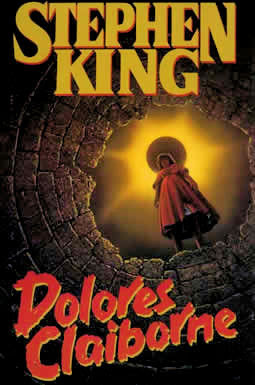 Dolores Claiborne has to be one of the most fascinating characters I’ve ever read in my life. She is spunky. She is intelligent. She will do anything for her children and she will tell you everything straight to your face. She’s like the Grandma I hope I can be when I grow up! Dolores has been accused of murdering her old boss, Vera Donovan. Because of this predicament, she is brought in by police for questioning, and boy, does she ever let loose. Dolores goes on a 384 page monologue about her family, her marriage, her work, and her life. She tells the investigators everything, without a care in the world as to the consequences. Throughout Dolores’ story, we get many emotional tales about those around her. Through the relationship with her husband, we view Dolores’ strength, courage, and overwhelming desire to escape. Through her relationship with her boss, we view her strong-willed stubbornness, her tenacity, and again, her desire to escape. And through her children, we see a Dolores who is loving, caring, patient, and determined to do what’s right. Her character is so multi-faceted, and no matter what she may or may not have done, you love her instantly and root for her from page one. If you have a chance, read this book. You will not regret it!